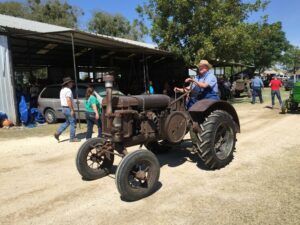 The weather was outstanding, the crowds were everywhere and the 48 acre show grounds of the Texas Early Day Tractor and Engine Association in Temple Texas was a-buzz with the smells and sounds of its 44th annual show held each year in October. This is the largest show of its kind in Texas and this one was looking to be the biggest ever. The homemade ice cream house had a long waiting line. The big engines sounds had gathered a large crowd around them but one unpainted 1930 John Deere GP Tractor seemed to be getting a lot of attention also. Why would this unassuming piece of equipment be so interesting? Well talk around this show for years had been of a One-Of-A-Kind tractor owned of one of its members, but until now few had seen it. The story goes like this. In 1991 on a trip to South Texas to visit a relative, I found a John Deere GP in very bad condition abandoned behind a barn. The years of salt water and setting outside had taken its toll. The owner said it was there when he bought the farm twenty years earlier. A few weeks later a deal was made for the tractor and it was hauled to Central Texas where again it did not receive much interest and was slid into a barn where it sat for years. 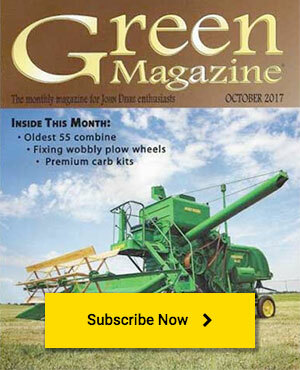 Then in 2008, as luck would have it, I saw an article about a Research Farm John Deere had near Robstown, TX. This GP was found very close to Robstown. Could this explain some of the strange parts on this tractor? It had an oil bath air cleaner, an oil gauge, a pressure radiator cap, extra holes tapped into the flywheel and the fuel tank was held on by straps not a hood as all other GPs were. After doing a little research, I contacted JR Hobbs and with several phone calls and e-mails and pictures exchanged, Mr. Hobbs said this could be a Test Tractor, one used to test upgrades to existing models. The GP had no serial number tag nor did it appear ever to have had one. He said this would be consistent with a Test Tractor for it was intended to be scrapped when testing on it was completed. At this point my luck changed and we lost Mr. Hobbs, and my health took a turn for the worst, so again the project went on a back burner with only the soaking of the very rusted parts being done from time to time. Then in 2013, my friend Dustin and I started back on this project, and we had no idea what we were about to find. The crankcase cover had a hole in so it was filled with water. That was not all bad because the water protected the covered parts from rusting and the connecting rods and crankshaft were in excellent condition, little to no ware and cleaned up easily. Once inside the engine, things got even more interesting. Someone had removed the Red Head oil indicator and had fashioned an oil gauge connection in its place. There were different sized valve lifters. The camshaft had different sized lobes. The governor had a sliding bearing race, which moved in a sleeve under spring pressure, not anything to be found in the parts book about that. These were only some of the oddities we found while getting it running. 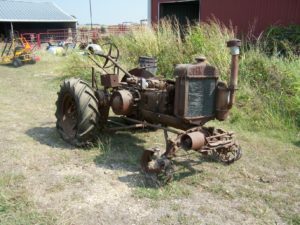 Others changes were found while at a recent show in Iowa and still others speculated by GP enthusiasts who have now seen the tractor. One very respected collector says this could be the first John Deere to have had pneumatic rubber tires, because of its airplane type rims welded onto original centers. Records show that John Deere was testing different lugs on its steel wheels during this time period, trying to find a way to minimize damage to fruit tree roots. Also other tractor manufactures were testing pneumatic tires on their equipment, which was shown, by a Nebraska test to provide better fuel economy and better traction. Nothing was done to the transmission and final drive except clean and replace the grease in them so who knows what else may be waiting to be discovered there. I plan to publish a scrapbook of pictures and descriptions of all the changes that have been identified so far, so others can weigh in with their opinions on this rather unique piece of farming history. Who said all the interesting stuff had been found. This one almost went to the recycle center. So keep your eye on those piles of rust, and who knows what is still to be discovered. I guess we will really never know for sure but the circumstantial evidence is very strong, that this is a One-Of-A-Kind John Deere GP Test Tractor.